Zoe Condliffe is founder & CEO of She’s A Crowd which is a social movement that uses crowdsourcing technology and storytelling to close the data gap in sexual assault and gender-based violence. Zoe has a background in gender equality advocacy and international development. Read her unique perspective on the USA Delegation to New York & San Francisco. Last month (June 2018) when I boarded a plane to fly to New York, I had great anticipation of a huge week meeting some of the most successful women in the original “female city”. I was excited to be heading to the USA to participate in a delegation of female founders of global tech companies as part of the SheStarts accelerator program. As the founder of a company and social movement building a global dataset of female experiences of sexual assault and gender-based violence, what better way to gain knowledge from other women than to spend time with some of the world’s most successful female founders? Our first day in New York we met Sallie Krawcheck, the most famous woman of Wall Street. Sallie told us that in the US, only 2% of venture capital went to female-led startups last year. This is despite the fact that women-run companies get 60% better returns than male-run companies. Women in STEM careers represent a mere 20% of the field, and are also paid less than their male counterparts. These experiences have driven some women in startups to take male pseudonyms in order to avoid being dismissed by VC firms, or even just in IT chat rooms. Women in literature have done this for time immemorial: posing as male authors in order to get published. History is repeating itself. Last year, two female co-founders of Witchly created a fake male co-founder. Their new male co-founder was able to get instantaneous responses while they were left waiting for days. The gender pay gap in tech is widening. According to the LA Gender Pay Gap Report, women are now paid 82 cents to the male dollar in tech, when a few years ago it was 97 cents. And Australia has one of the worst gender pay gaps in the world, with women in tech being paid 20% less than men. This is not a women’s problem, and this is not just a tech problem. This should concern all of us. 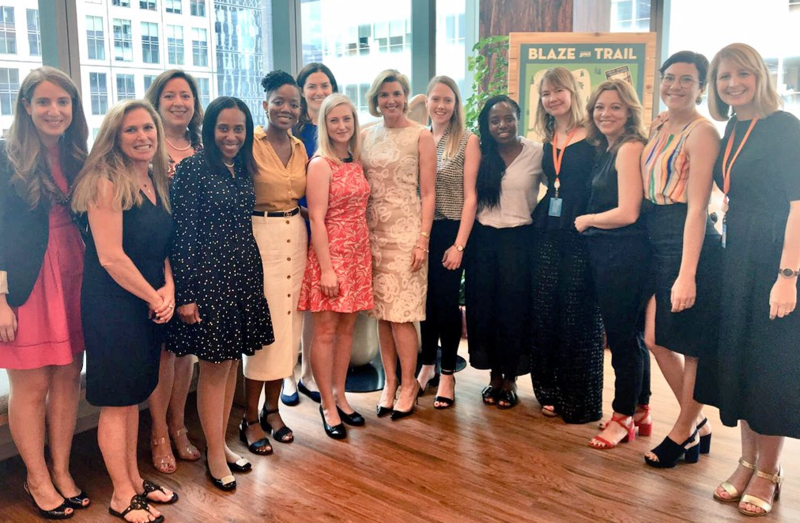 The SheStarts founders with Sallie Krawcheck from Ellevest & other powerhouse women from Salesforce. Not with us? We’ll leave you behind. SheStarts creator Nicola Hazell often talks about the way that women are able to identify problems that men don’t experience, and solve those problems in a completely fresh way. The free market should be concerned about what it’s missing out on when it excludes women. The free market is not blind. We participated in many panel discussions and events in the USA that spoke about unconscious bias and the funding gap in male and female led startups. Women have 83% of the purchasing power in countries like the USA and Australia. From an economic standpoint alone, it would be foolish not to recognise women as key players in the industry. Like the canary in the coalmine for social issues, women are the ones who often experience social inequity where men do not. Therefore, women hold the key to unlocking the biggest social issues of our time. If only we would let them. While I was on the plane from Melbourne to New York, a woman called Eurydice Dixon was raped and murdered just around the corner from my home in Brunswick, Melbourne. I heard about it after I landed, and watched the media storm grow from afar. I watched my friends and community back in Melbourne grieve, grow angry and attend a vigil with thousands to mourn her life and reclaim our space. It was strange being away from home at a time like that. I’m a vocal activist in my community on the issue of gender-based violence and sexual assault, and seeing it from afar gave me pause for reflection. I was proud of my community’s response. It struck me how much more articulate we’ve become, using our understanding of feminist concepts to stand up for our rights to access public space and not be blamed for the crimes committed against us. We have power of information we’ve never had before, and it is strengthening our ability to build social movements. Violence against women is like a slow burning plague that never received the research, funding or defence force effort to exterminate it. It continues on, unchecked. Every now and then something happens (white woman dies in public at the hands of a complete stranger) and everyone gets upset. Politicians say lots of words. Women keep dying. Women die in custody (Aboriginal women at alarming rates), women die at the hands of their partners or ex-partners (the most common way to die of a preventable cause if you’re 14-44 in Australia), women die on their way home from a gig, like Eurydice. Women die every week like this. It’s scary that another woman has died, just down the road from where I live. It’s also scary that women are actually more unsafe going into their homes at night than they are leaving them. Gender-based violence is complex and can take many forms. We are a long way from understanding this completely, because women are not the ones who have traditionally had avenues to share their experience. History books reflect the male narrative. So do the crime statistics: less than half of sexual assaults are reported. Cities have been traditionally designed by men, for men. Even a city like New York, where there are more women than men. Technology provides us with an opportunity to rebuild, and redefine our cities, our spaces and lives. Technology is another layer which allows for a certain “democratisation” that transcends existing structures. Anyone with access to the internet can access information, and this access is expanding at unprecedented rates. This provides a huge opportunity. Given that technology and the free exchange of information is definitional to our era, women should be an equal part of it. That’s just not the case. The good news is, from our trip to the USA, we also witnessed a lot of progress. We met women who gave us endless amounts of their time, running late to their own meetings in order to mentor us, guide us, inspire us, like Meredith Finn from Salesforce and Nisha Dua from BBG Ventures. Women who stayed up until 2am, workshopping our startup business plans like Adi Abili. Women such as Samantha Katz, Lizzy Walmarth and Meg Bear who invited us into their offices, their homes, their family distilleries to share with us their vulnerabilities and golden insights into the industry. These women who I had the pleasure of meeting in the USA, together with the women founders at SheStarts, the women mentors, coaches and directors from BlueChilli, are all women who understand that we have a opportunity for growth ahead of us, and that we’d better be in it together. Sometimes it’s hard to imagine a world where women actually can do anything they want, because the data shows that is not a world we currently live in. But the women we had the privilege to meet in New York City allowed us to imagine, even if just for an hour, what that world would look like. They showed us what it was to be bold, to command a room, to be successful enough to spread that success around. They reminded us that as women, the world is waiting for us to step into our full power. And when we do, something magical happens: we change it. With a Masters of Community Cultural Development in women’s stories, Zoe is a gender equality advocate with a background in international development, project management and building youth-led social change movements.